I was back to Iqbal Hall the following morning. Shortly after I reached the hall, I could clearly discern a generally uneasy feeling which quickly escalated into a foreboding by mid-day, and then turning into anguish by the afternoon. Everybody looked worried. We came to know that President Yehia Khan had leftDhaka; various reports were coming about army movements and the increasingly belligerent Bihari activities in Mirpur and Mohammadpur made the atmosphere gloomy and nervous. Throughout this period, I was at Iqbal Hall, taking part in various miscellaneous activities and eagerly waiting for directions. Around 9:30 p.m., Abdul Baten Chowdhury, an important student leader at that time and with whom I had became close during the previous few weeks, asked me to go home. It was about 10:10 p.m. when I left for home; I took a shortcut by crossing the road across Iqbal Hall to Mohosin Hall; entering the Mohosin Hall I entered the slum by jumping over the boundary wall; and then through the slum reaching New Elephant Road. There I found an boisterous crowd making roadblocks with a bricolage of materials—with whatever they could find in the vicinity. The feverish and hysterical crowd activities made the air thick with apprehension and a premonition of a devouring blanket of glooming was quickly descending over me. Taking another hasty shortcut though a connecting road by the People’s Daily office, I emerged in front of the Intercontinental Hotel (now Sheraton Hotel). I crossed the road and reached the footpath running along the hotel and discovered that the Pakistani Army had surrounded the entire hotel, their menacing weapons clearly visible from such proximity. I quickly crossed to the other side of the deserted road and soon reached home. I was probably not surprised to find that everybody at home scared and morose. Fear of some impending disaster had etched its somber mask on everyone’s face; everybody seemed waiting for something ominous to happen. A sense of extreme anguish pervaded the dimly lit house. On the night of 25 March 1971, the following were the occupants of 39 Minto Road. My eldest sister, a housewife; her husband who was at that time the Relief Commissioner of East Pakistan; their four children, the eldest of which was about eight years old; my unmarried sister, temporarily living with my eldest sister; my brother, who was working at the Atomic Energy Commission; two house helps; and I. My elder brother, a scholarly gentleman of delicate disposition, told me not to raise my voice. Everybody in the house were behaving abnormally, limiting all conversations to synthetic whispers. Suddenly, the stillness of the night was ruptured by a short burst from an automatic weapon (this incident took place at Eskaton Road) making everybody almost jump in nervous apprehension. We all kept glancing at each other with scared expressions. Someone told me to take my dinner, which I ignored as I was not hungry. All hell broke lose around 11:30 p.m. Gunfire started all around us followed by bellows of many people; the bellows then turned into screams and finally they stopped–replaced only by the deadly sound of death and destruction. In 1971, Minto Road was literally at the heart of the city. Across the Intercontinental Hotel, inside the lane that ran along Sakura Market, was the People’s Daily that was attacked by the Pakistani Army and was completely burnt down along with many other shops in the vicinity. Rajarbagh Police Lines and Peelkhana were attacked and so were Iqbal and other residential halls and quarters of Dhaka University. On 25 March 1971, the Pakistan Army emerged as the terminators of Dhaka, in the literal sense of the word. A few of us climbed to the roof of the two-storied house. Some of the less adventurous members subsequently joined us. In the moonless and clear March night sky the brilliance of the shinning stars failed to attract anyone’s particular attention. The sound of gunfire and the coruscation of the tracer bullets all around reminded me of some kind of travesty of celebrations, the birth agony of an independent nation. The whole night, from time to time, my eldest sister would loudly lament by holding me and I, not knowing how to console her, dumbfounded by the apocalyptical turbulence, kept holding her without uttering a sound. My brother, now timorous and shivering, took shelter under a bed; my brother-in-law, who had joined us at the roof and now visibly shaken, went back downstairs. The other sister kept under the shadows of my eldest sister with scared blank eyes, crying and reverberating with each loud explosion. I too was scared, not only by the sound of so many weapons but also in the company of so many panicked people in the house. It appeared that the entire Dhaka city was being annihilated. Panic is very similar to a virulent virus—it infects everyone with prolific rapidity. We could hear the sharp cracks of rifles; the tat-tat-tat of the machine guns, the earth-shattering explosions of mortars bombs, recoilless rifles, and tank shells; and the din of various unknown weapons all around us. A stray bullet would often fly over the house making a peculiar noise as it flew perforating the air. Sudden illuminations followed by loud bangs, and the dancing of the tracer rounds in the sky resembling kaleidoscopic fireworks lit the dark sky in a frighteningly beautiful travesty of celebrations. The aerial distance between Minto Road and Rajarbagh Police Lines is less than a mile. We could clearly hear the battle raging there. Sound of automatic fire responded by the sharp crack of vintage World War II .303 rifles; gunfire was also coming from the university areas and Peelkhana, the Headquarters of East Pakistan Rifles (EPR). All around us, it was the sound of death and destruction. The burning of various houses and slums created permanent patches of brightness all around the city and were clearly discernable against the background of a dark moonless night. Around 3 o’clock in the morning, the sound of gunfire appeared to be slackening and gradually grew sporadic; finally, around 4 o’clock dying down, occasionally punctuated by stray cracks. Finally, it was morning; none of us slept the previous night. The diffusing sunlight started to infuse some courage into our torpid bodies; we started surreptitiously glancing through the window, though, not much was visible but a tiny stretch of paved road in front of the house. Deadly calm now replaced the frightening sound of gunfire, smell of pungent cordite replacing the morning breeze; the night’s carnage making even the morning birds forget their daily twitter. We sat dazed; our limbs losing locomotion. We forgot speech; essential communication remained confined to signs and gestures; the silence occasionally was interrupted by our loud involuntary sighs. Everything seemed lost and desolate; as though we were the sole survivors of the Armageddon. But then slowly hunger overcame our fears; the children needed to be fed, the adults required sustenance, and sprit of being alive gradually prevailed. We started calling our relatives and friends to find out what disaster had befallen them; whether they were alive and well. Gradually, as we started receiving information from our friends and relatives that they were alive and unhurt, we felt encouraged that there were others who were alive as well; not everything is lost after all. The radio told us that the Pakistani administration had imposed an indefinite curfew in Dhaka. We were so scared that no one dared to leave the security of the four reassuring walls, not even daring to venture into the courtyard. Everybody wanted to know what had happened: the extent of previous night’s carnage, news about resistance, and the opinion of the world community. In 1971, cutoff from the rest of civilization, the only means of obtaining information was the radio. Everybody assembled centering the radio. The volume was kept at the barest minimum; our ears almost sticking into the radio with frequent jockeying for favorable positions. The person holding the shortwave radio would occasionally tweak or change directions of the antenna for better reception but not always with success; and when unsuccessful, the assembly expresses its disapproval by the involuntary twitching of their bodies. We listened to BBC, Voice of America, Aakas Bani (Indian Bangla), Radio Moscow, and even Radio Peking. We spent the entire day listening to the radio, speculating on rumors, optimistically interpreting the international news, buoyant assessment of resistance, and even managing a few bravados. The fading daylight then started to sap our courage, the sound of activity gradually muting, and the growing quietness fuelling our fears and worries. Every sound of a passing vehicle multiplied our apprehensions. Rife with runway imagination, and almost blinded by the four walls, our ears seemed to have assumed supernatural abilities. Any sound coming from outside the house including moving vehicles became the source of various foreboding. Someone thought of hearing the sound of tanks moving nearby and nobody daring to sneak a peek. As the night marched it became very quiet, occasionally interrupted by the howling of stray dogs fighting over spoils of the previous night’s carnage. I was so tired from sleeplessness that in spite of the overall gloom, I found solace in blissful sleep. I woke up completely refreshed the following morning. The curfew was lifted on 27 March for a few hours and I decided to go out and have a look. The streets were mostly empty; rarely a car would pass; its frightened passengers casting anxious glances through the windows. I saw very few pedestrians, the street was almost empty. When I reached the intersection near Ramna Park, I saw an army jeep, with its windshield folded on the bonnet, was coming toward me from the direction of the Hotel Intercontinental. The vehicle had four passengers: two at the front and two at the back. The person in the front seat, next to the driver, looked like a junior officer while the two at the back were definitely not officers. However, my attention was totally consumed by a gigantic machine gun mounted on the jeep and loaded with a metallic belt of very large, shiny, and menacing ammunitions. The machinegun was so huge that the barrel extended nearly to the end of the bonnet of the jeep. All four of the passengers were apparently very amused about something and were laughing loudly. They completely ignored me as the jeep passed by. Reaching the hotel I found it was still being occupied by the Pakistani Army; the guns still sticking out over the low perimeter walls, and now in daylight, I could see the faces behind the guns; savage grins in their faces. A glance at them only returned a ferocious growl; I crossed the road to the other side of Dhaka-Mymensingh road. Entering the lane opposite the hotel, I saw destruction. There were a number of shops on the right hand side of the lane. All shops were now burned down. Among these gutted shops was a saloon where I used to take my haircut. I found the saloon too was completely burnt and some smoke was still oozing. Then, I saw a body, in a sitting position, leaning by the wall at the right corner of the small room. The body was completely charred! I went inside the small burned shop and touched the body—it was charcoal! I had never seen a human body burnt so badly but strangely, I was not afraid or scared. Something inside me was already revolting, I found myself silently swearing; effervescent vengeance and hatred was growing inside me. I must have known the deformed humanity, now nothing but a heap of charcoal, sitting a few feet from me. He must have been one of those that cut my hair. I remembered a small bearded man who often trimmed my hair; the charcoal-man might be the same person. I left the shop and headed for the People’s office. The entire building was burnt, some of the heavy woods were still smoldering and smoke was still coming out. I knew what sight awaited me inside. I did not bother to look inside; from the People’s office; I returned to the main road and started striding toward Dhaka University. When I reached the Teacher Student Center (TSC) intersection, I saw a small crowd going toward Jagganath Hall. Curious, I followed them. Entering the narrow lane, I found many people looking at something by the boundary wall of Shamsun Nahar Hall. First, I noticed a number of freshly dug ditches filled with earth; then there was something else in it. Seen from a distance it resembled a human limb; nearer, the resemblance is stronger; close up, certainly, it is a human leg—the leg of a human! As I approached the wall I saw more hands and feet sticking out of the graves. I was horrified to see a few crows, particularly one that was pecking flesh from a human leg sticking out from a ditch. I felt sick but controlled myself. There were other human limbs similarly sticking out from other graves offering a feast to the crows. I also saw two or three dogs fighting a losing battle with the crows over the spoils. By this time, my blood was boiling with anger; I was being engulfed with hatred at the inhuman barbarity of the Pakistani savages. Instantly, I vowed of retribution—the Pakistanis must pay in kind for their crimes. I left the scene of the gruesome exploits of the psychotically sadistic Pakistani soldiers. Continuing onwards I entered Iqbal Hall through the Palashi gate. Dried blood was everywhere—signs of dragging of dead bodies. I entered some of the rooms on the first floor—blood, blood, and blood everywhere I looked. I had seen enough; I left Iqbal Hall. After that, I do not remember seeing anything else that day, the thought of revenge and vengeance had completely blinded me. I wanted blood of the Pakistanis. The only other thing I remember happening on the 27th evening was that some Major Zia, on behalf of Bangabandhu Shaikh Mujibur Rahman, announced the independence of Bangladesh. Immediately I decided to join the fighting—at the earliest available opportunity. On the 28th, there was a small crisis in the house. I found my brother-in-law became very scared. Apparently, someone had threatened him over telephone. Many years later, my brother-in-law divulged the identity of the callers. These two Pakistani collaborators were some Ata Khan and his associate, both were businessman. They used a Pakistani commando officer by the name of Brig. Jahanzeb Arbab to deliver their threats. After receiving the threatening calls, my brother-in-law became very apprehensive and immediately planned to leave the house. He contacted some of his friends and well-wishers willing to provide temporary shelter until the situation calmed down. The kind person that extended help was Dr. Baset, a renowned skin specialist. 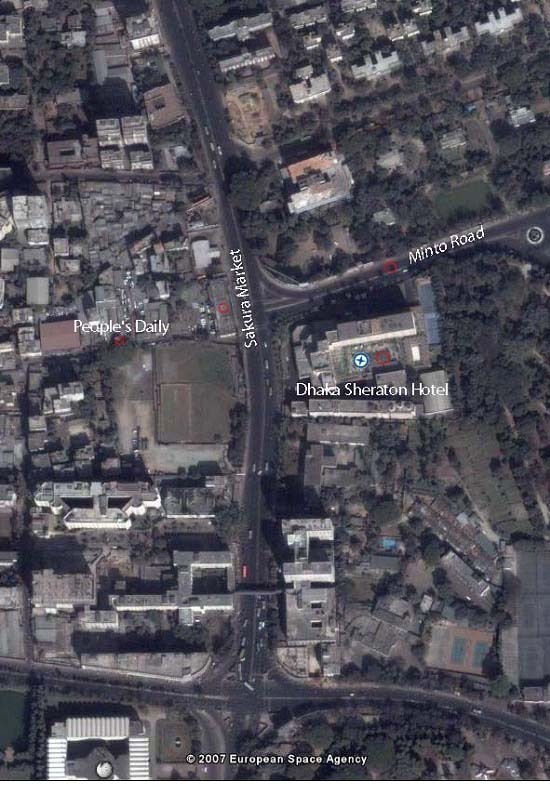 Dr. Baset’s house was at Paribagh, very near to the Intercontinental Hotel. I think we took shelter in that house for about two days. Meanwhile, ominous rumors started circulating that many young people were being abducted by the Pakistani Army; subsequently tortured and killed. Since I was the only teenager in the house, it was decided that I should be shifted to another safe location. Thereafter, I ended up in a house at Banani, in the residence of Mr. Hakim, who later became a Managing Director of National Life Insurance Company. He is a relative of Mr. M.K. Anwer, a former CSP officer who had lost his job in 1969 under the so-called 303. In 1971, Mr. M.K. Anwar was a Deputy General Manager at Habib Bank of Pakistan and was posted at Karachi. He came to visit Dhaka just before 25 March and was stranded here. There were only a few persons in the house, Mr. M.K. Anwar, Mr. and Mrs. Hakim, and I. I stayed there for two or three days and during this entire period; I was consumed in scheming to join the fighting that was taking place in various places around the country. In and around the Minto Road, there were others of my age and before 25March we had a number of brainstorming sessions to prepare plans to counter the Pakistan Army in case they attacked. We inventoried the number of guns in our respective houses, the status of shotgun shells, and the possibility of making Molotov cocktails. We also planned to dig a large ditch to block Minto Road, and many similar far-fetched plans. After the 25th, however, I could not find traces of any of these pusillanimous individuals—they appeared to have simply vanished. I had a collage friend who lived at the Circuit House in Paribagh. I found him very spirited and he had expressed his earnest desire to fight the Pakistanis, if and when required. Therefore, I was expecting him to accompany me in the forthcoming journey to join the armed struggle; but unfortunately I had no contact with him after the 25th. I needed some money for the journey and my cerebrum was busy in hatching a plan to obtain it. After 25 March 971, Dhaka city used to be unusually quiet after sunset. People hardly came out of the house after dusk; the only thing most people did was to listen to the friendly radio stations and through the radio I came to know that Bhramanbaria was a resistance stronghold. I planned to join them at the earliest opportunity. My plan was made. Brilliant writing, I just could not stop till I reached the end. Eagerly waiting for the book to be published and where ever I am I will be in Dhaka that day to celebrate the launching of the book. MY GOD !!! a book written by a valiant and the youngest freedom fighter of our country. HATS OFF!!! !